Jo is hosting this fun Blog Hop over at Serendipitous Stitching . We are supposed to post things that are Easter related or springy. I made it into a card to send off to someone. I wonder who? I finally finished my spring panel for Tall Year Squared. The fabric is supposed to be a light purple. The colors are really lovely and I enjoyed stitching this panel. Here is your letter for the HOP! Now hop on over to Needle, Pen & Sword for your next letter! 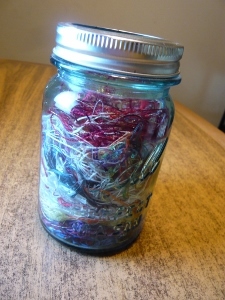 You take a photo of your container that you throw your left over threads/fibers. What was I working on? I know it is more than one year of orts.. This is a stitch-a-long hosted by Heather . 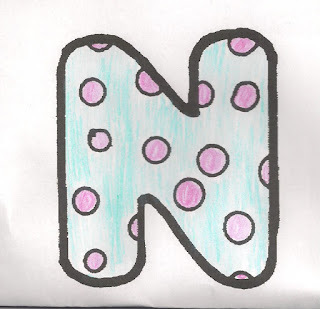 We are supposed to post at the end of the month any smalls we have completed. 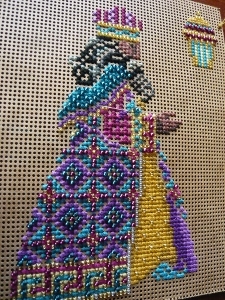 Balthasar is all beaded and ready to finish! I need to pull the whole set out and finish them and figure out how to display them But Christmas is a while away...Right? I have another small that I finished but it will have to wait a few more days! 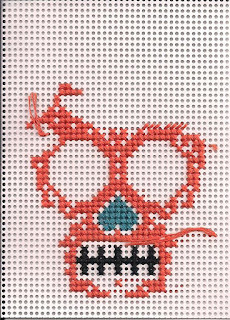 I thought I would have more stitching time last week and would have something new to show, but car troubles and taking the youngest for a college visit ate up a lot of my stitching time. The upside of that was I was able to spend a lot of quality time with my husband and dd. A little creepy at this point, but the colors are so much fun! I had hoped to finish the last Magi, but it was not to be. 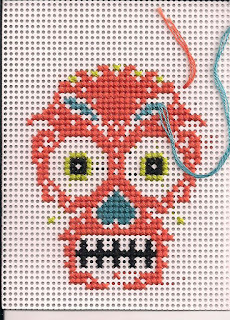 But I have been stitching on a piece that I will eventually give away! 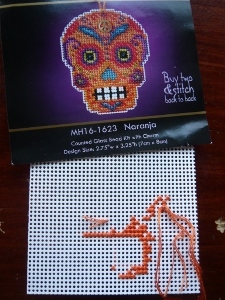 has this lovely stitch-a-long where you post things you have received as gifts, are stitching as gifts or has even the slightest thing to do with gifts! 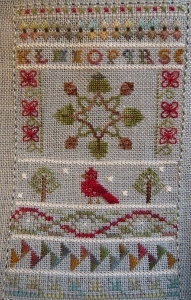 We all receive such lovely things from each other and it is fun to see what others are stitching. A little too Halloweenie for me to keep, but I have several members of my family who would be happy to have this one or one of the others I have in my stash. And they are very bright and a fast stitch. 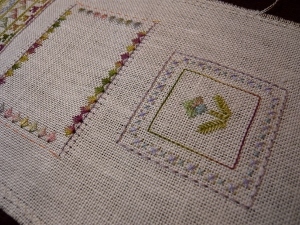 I am super busy the next few days and am having a difficult time finding stitching time for my large projects. Anyone else in my same boat? What do you do about it? I was able to get this panel done for Tall Year Squared. The threads are lovely and the design is gorgeous, but I am ready for something else! Some of my other projects are calling my name. Hopefully I can get the next panel done quickly and move to a different project. It isn't until the end of the month and you can see if she still has room to join the fun! I don't like this photo, but it does show how close I am to a finish! Just a few more beads and he is done! I think I found an idea for finishing all the pieces. Will have to do a little more research, but I hope it will be something I can use for other things too. I have several pieces now that need to be FFO (is that Finally Finished Object?). I just need a day to do them. Does anyone one have a day to spare? I finally had time to do my give-a-way and decided on two winners! And CalamityJr, you won the second prize. I will email you both and you can send me your snail mail. I probably won't get to the post office until later next week, but I will do my best! Wish I could have given something to everyone. Thanks to all for your kind wishes. 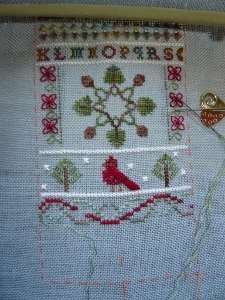 Now on to regular stitching! I may even have something to post soon! on Fibertalk. They have designers and store owners on and they interview them. They just put up a series of videos on the Nashville Market if you want to see some of your favorite designers! Anyway, they are the ones that got me started on Flosstube. What is Flosstube? 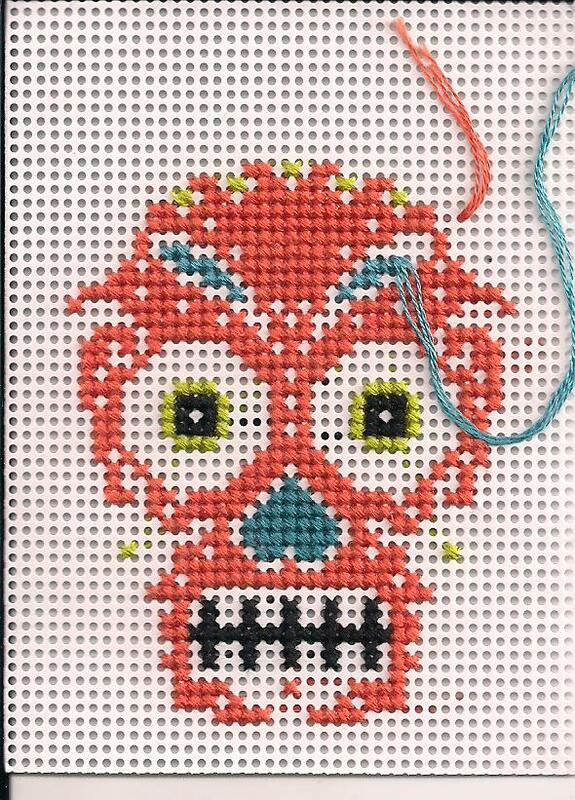 It is a channel on Youtube of people who cross stitch(mainly). I have a few I like and a few I dislike, but I feel that is all a matter of person preference. I never put a thumbs down on a video. I just skip it and watch someone else. There are tons more; all you have to do is search. I tend to watch when I am doing something boring like washing dishes or cleaning the bathroom. (I more listen than watch.) I also play Flosstube while I am doing some stitching. So, do you watch Flosstube? Who do you watch? NO! I am not starting a Flosstube channel. I do not have time and editing videos is one of my least favorite things to do! I'll Wait a Few More Days! I decided to wait until Friday to do my drawing. Why? I am busy and I want to give a few more people a chance to enter. Make sure you comment on the right blog post! Will let you know who won on Saturday! This is in celebration of my having 1000 posts! How did that happen? I am really not a sugar skull person, but I think some family members might like them when done. Don't forget to sign up for my give a way HERE! I bet you forgot about this piece! 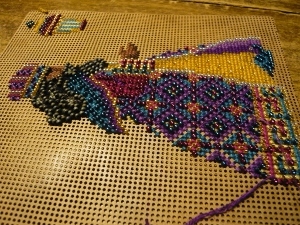 The beads on this are taking a long time. Hopefully this will be my finish for the Smalls SAL this month. I keep thinking I will get this panel done and can more on to the next one. I guess if I stopped making so many mistakes! First I had to rip and restitch those white bands at least three times and then I discovered that I used the wrong green on my trees! No ripping this time as I was most of the way done! 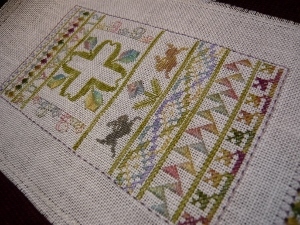 One more line of cross stitch, another white band and then two more large bands. Rats! Does that mean another white band too? Hmmm. I am so ready for Spring! Don't forget to sign up for my give a way here.